Putting your house on the market this summer? 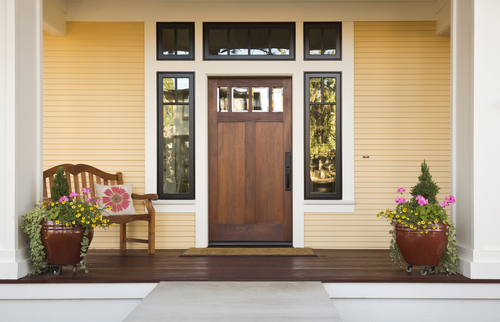 It can be a great time for you to sell if you do a few things to increase the curb appeal and get the word out. First, spruce up your front lawn by mowing twice a week. Freshly cut grass appeals to the senses; it smells like home and summer (a welcoming scent when someone steps out of their car to look at your house), and it looks nice (try mowing diagonally every other time to create visual depth). Spread some new mulch. Wash off garden décor or stepping stones. Trim the bushes and plant bright flowers or flowering shrubs. Second, stage the back yard. Remove the grill cover and add mitts and tongs beside it. Set the outdoor dining table with summery tableware or circle chairs to make a cozy seating area. If you have a pool, roll up some towels and place them by the edge. Then, open it up! Open windows and screen doors to let in the fresh air. Pull up the curtains or open the blinds to let in the summer sunshine and enjoy the view of your refreshed front lawn. Next, lighten up your living room and bedrooms by replacing throw pillows, blankets, and even rugs with white, light blue or other brightly colored (i.e. “summer colored”) accents. Soften up the rooms by removing heavy blankets or large pieces of furniture. Place vases of flowers (real or fake) on night stands and end tables. Then, set out some summer refreshments. Fill the sink with ice and cold drinks or set out pitchers of fruit water or lemonade. A platter of bite-sized fruits or grapes can be cool and refreshing. And be sure to drop the thermostat setting a couple degrees so people will want to stay in your home longer to look around and to compensate for all the doors opening and closing. Finally, with the sun setting later, people stay out later so be prepared for homebuyers to stop by in the evening hours. Lots of people skip out of work early during summer months, or take long weekends so you may experience more traffic on Friday afternoons or Mondays.